The U.S. military's competitive advantage against potential adversaries is eroding, the chairman of the Joint Chiefs of Staff told the House Armed Services Committee today. The American military today is the most capable force in the world, but that can change, Marine Corps Gen. Joe Dunford said during a hearing about the president's fiscal year 2018 defense budget request. "Since 9/11, an extraordinarily high operational tempo has accelerated the wear and tear of our weapons and equipment," he said. "Meanwhile, budget instability and the Budget Control Act has forced the department to operate with far fewer resources than required for the strategy of record." The Defense Department was forced to prioritize near-term readiness at the expense of replacing aging equipment and capability development, Dunford said. "We've also maintained a force that consumes readiness as fast as we build it," he added. "We lack sufficient capacity to meet current operational requirements while rebuilding and sustaining full-spectrum readiness." But the U.S. military faces a further near-term challenge, he said. 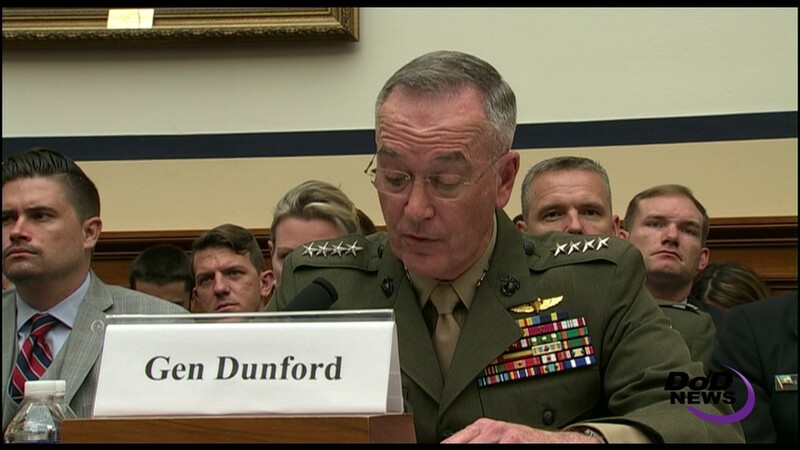 "While we are primarily focused on the threat of violent extremism, our adversaries and potential adversaries have developed advanced capabilities and operational approaches specifically designed to limit our ability to project power," Dunford told the House panel. "They recognize that our ability to project power is the critical capability necessary to defend the homeland, advance our interests and meet our alliance commitment." Russia, China and Iran field a wide range of cyber, space, aviation, maritime and land capabilities specifically designed to limit U.S. military's ability to deploy, employ and sustain forces, the general said. "Russia and China have also modernized their nuclear arsenal, while North Korea has been on a relentless path to field a nuclear [missile] that can reach the United States," he said. "In just a few years, if we don't change the trajectory, we'll lose our qualitative and quantitative competitive advantage." If that happens, he said, the consequences will be profound affecting U.S. nuclear and conventional deterrence and the U.S. ability to respond if deterrence fails. "Alternatively, we can maintain our competitive advantage with sustained, sufficient and predictable funding," he said. "To that end, the [fiscal 2018] budget is an essential step. However, this request alone will not restore readiness or arrest the erosion of our competitive advantage." Reversing these trends will require sustained investment beyond fiscal 2018, and the department will base any future requests on the forthcoming strategy development, he said. "However, we know now that continued growth of the base budget of at least 3 percent above inflation is the floor necessary to preserve today's relative competitive advantage," he added.